This is a compilation of the winning entries of every challenge in the Card Design Challenge thread to date. Challenges are underlined, and their respective winners are in underlined brackets. Subtypes of Artifacts, Locations and Abilities which have no impact on gameplay are marked as "None". -If Aleta is in the graveyard for 6 consecutive turns, she returns to play. -Exhaust, Pay 5: Discard a random card from your opponent's hand into your graveyard. The discarded card gains Exile X, where X is the cost of the discarded card minus 1. If this card already has Exile, the lowest value is chosen. 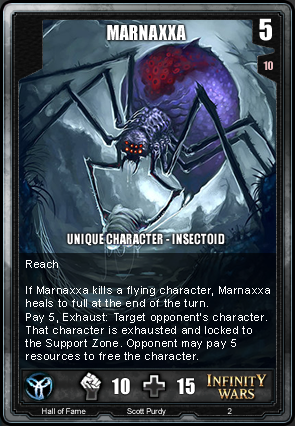 -If Marnaxxa kills a flying character, Marnaxxa heals to full at the end of the turn. -Pay 5, Exhaust: Target opponent's character. That character is exhausted and locked to the Support Zone. Opponent may pay 5 resources to free the character. -If Ith's Egg dies while in the Defense Zone, he deals 2 damage to all opposing characters and freezes them. 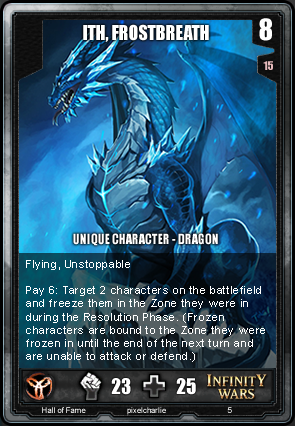 (Frozen characters are bound to the Zone they were frozen until the end of the next turn and are unable to attack or defend.) Additionally, an Ith, Wounded Hatchling is summoned in your Support Zone. -If Ith, Wounded Hatchling survives until the end of the turn he evolves into Ith, Frostbreath. 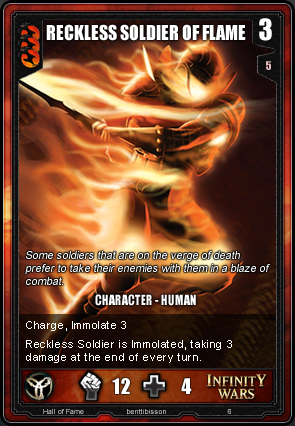 -Reckless Soldier is Immolated, taking 3 damage at the end of every turn. -Cantric's cost is increased by 1 for every different kind of card remaining in your deck or hand. - If Cantric is a commander, you may have up to 4 of any card in your deck, including unlimited cards. -When Cantric is deployed he has +3/+3 for every 2 cards in play or in your graveyard that have the same name. This effect can only occur once per card name. -Target character gains Flying and +2/+2 if it does not already have Flying. -Target character loses Flying and gains Consume 2 if it already has Flying. -Whenever your opponent discards a character, remove it from game. -If it is still in your opponent's graveyard at the end of next turn, Desert of Irrationality gains 1 charge for every card removed in this way. -At the start of the turn, if the charge reaches 10, reset the charges to 0 and put every character removed from game in this way back into play under your control. -All characters from all graveyards are raised into your Assault Zone. These characters are removed from the game at the end of the turn. -When Chengde enters the Deployed Zone, each opponent's Morale is reduced by twice the characters each opponent currently controls. -Whenever two or more characters you control are killed by an opponent's effect, draw two cards. -If the Disciple is in the Assault Zone, he and the character with the highest power in the enemy's Defense Zone deal combat damage to each other. -If he kills the enemy character, he restores up to his full health and gets +2/+2. -He cannot be killed through combat damage if he kills that enemy character. 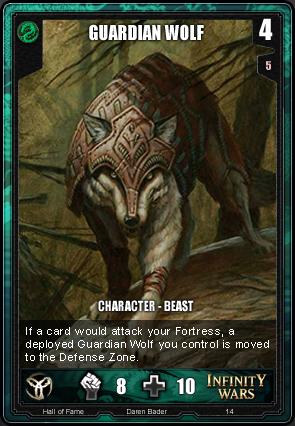 -If a card would attack your Fortress, a deployed Guardian Wolf you control is moved to the Defense Zone. -Hell's Tokamak gains 1 Charge the first time you discard every turn. -Discard a random card, exhaust: Hell's Tokamak gains 1 Charge. -Sacrifice X Charges, exhaust for 2 turns: all opponent-controlled characters on the Battlefield take 2X damage. X can be customised. -Choose one Deployed Zone. All characters in that Zone (yours and your opponents') are removed from the game. -While this card is in play, all Beasts gain +X/+X for every max resource above 10. -After Strato-Swallow finishes combat for the first time in a turn, it moves to the Support Zone. Characters with the Disguise ability have the option to be played as a 7/6 Kyren Acolyte Unlimited Character for 3 resources. Unlike the real Acolytes, these will have additional UI visible only to the controlling player, depicting what the real card is and allowing the player to Reveal them for an additional resource cost. -Pay 4, exhaust: Target deployed character you control is moved to either the Assault Zone or the Defense Zone this turn. -You may choose to play Kyren Cutthroat Disguised. -Pay 2: Reveal Kyren Cutthroat. Kyren Cutthroat deals an additional 4 damage to the first character or fortress she damages this turn. -You may choose to play Havoc Disguised. -The first 2 times that Havoc would enter combat with another character each turn, that character is instead moved to the back of their current Zone. -You may choose to play The Maestro Disguised. -Pay 8: Reveal The Maestro. -The Maestro can't be blocked by characters with higher power than his. -Disguised characters you control cost 1 less resource to Reveal themselves. -Activate: Ghost of Morning Dew deals itself 5 damage. Your base resources are increased by 1 next turn. Activate this ability only when deployed. -Pay 1, sacrifice Slice n' Splice: Create two 6/6 Artificial characters named "Slice" and "Splice" in your Support Zone. Use this ability only while deployed. -If Slice n' Splice dies while deployed, create a 6/4 artificial character and a 4/6 artificial character. These cost 6 Morale each when they die, and aren't given names. -You cannot deploy Slice n' Splice if another character with the same name is in the graveyard. -Pay 3, sacrifice target Splice character: Slice evolves into Fusion Slicer, a 12/10 Artificial character. -Slice has +2/+0 while in the Assault Zone. -Pay 3, sacrifice target Slice character: Splice evolves into Fission Splicer, a 10/12 Artificial character. -While Splice is in the Defense Zone, all Artificials in your Defense Zone are healed for 3 health at the end of each turn. -Pay 1, remove Fusion Slicer from the game: Create two 6/6 Artificial characters named "Slice" and "Splice" in your Support Zone. Use this ability only while deployed. -Fusion Slicer has +8/+0 while in the Assault Zone. At the end of the turn, Fusion Slicer heals for 3 damage. -Pay 1, remove Fission Splicer from the game: Create two 6/6 Artificial characters named "Slice" and "Splice" in your Support Zone. Use this ability only while deployed. -While Fission Splicer is in your Defense Zone, all Artificials in the Defense Zone have +2/+0, take two less damage from all sources and are healed for 2 health at the end of the turn. -Magitech 2K1V costs 1 less for each time one of your characters gained additional power or health during the game. -Pay 3, Exhaust: Target character has +25/+25 and gains Unstoppable, Shield 2 and Immolate 5 until Magitech 2K1V targets another character or leaves play. -Create a 4/6 Meditating Monk in your Support Zone. -Create a 4/6 Pilgrimage Monk in your Support Zone. -Create an Intimidating Monk card in your Hand. -Create an Anti-Air Missile card in your Hand. -Create a Cannon Fire card in your Hand. -Create a Flashbang card in your Hand. -Create a Summoning Stone Artifact. -Create a 2/2 Rita's Thrall in your Support Zone. -Create a Blood Arrow card in your Hand. -Create three Ancient Egg Artifacts. -Whenever a Champion is deployed under your control, all characters you control get +1/+1. -Until end of turn, if a character an opponent controls blocks and survives, it is sent to its controller's Support Zone. -At the beginning of the resolution phase of the turn, if Zhao, Challenger of Champions is in the Defense Zone, your opponent loses morale equal to the combined resource cost of all characters in their Support Zone. -If Zhao, Challenger of Champions is in the Defense Zone, whenever your opponent plays an ability card they lose morale equal to double the resource cost of the ability. -Whenever any opponent-controlled creature would take damage this turn, they take double that damage instead. -Whenever any opponents' fortress takes damage this turn, it takes double that damage instead. -You lose game at the end of next turn. -At the beginning of every turn, you lose 3 morale. -Pay 3, Exhaust: Target player gains control of a deployed character you control. That character cannot be moved from the Zone it's in and cannot activate any activated abilities it has. -Pay 1, Exhaust: Search your deck or any graveyard for a card, remove it from the game, then shuffle 2 copies of it into each opponents' deck. -Pay 6, Exhaust: Search your deck or any graveyard for a character card. Deploy it under your opponent's control in any Zone. That character cannot be moved from that Zone. -Target a deployed card you control and a card on the Battlefield. Each card gains the sub-types of the other if it does not already have them. -The Power and maximum Health of both cards are averaged. -Whenever a character you control would die from a non-sacrifice source you control, this mission becomes 20% more complete. -When this mission is complete, characters in each player's Assault Zone attack their own Defense Zone instead this turn. -You may remove any number of cards (X) in your hand from the game. The first 1+X abilities your opponent plays fail to resolve this turn. -Pay 1, Exhaust: Discard 1 random card from your hand, then draw 1 card. -Each time you discard a card, Mad Chronicler gains +2/+2. -When Mad Chronicler dies, draw 1 card. -At the beginning of each turn, your opponent may pay 2. If they do, sacrifice Krusk, the Resilient Thrall. -The first time Krusk would be sacrificed each turn, he instead becomes exhausted and gains +3/+3. -The first time Furball would take combat damage, it is negated to 0. -Pay 3: evolve Furball into an 8/10 Spineball character. -When Spineball dies, each character in the opposing Assault Zone is dealt 1 damage. -Lyen's cost is reduced by X, where X is the total cost of all demons you control on the battlefield. Her cost is raised by 1 for each ability you have played this game. -When Lyen enters the battlefield, all players' abilities in hand are replaced with a random one from the same faction, regardless of purity. All your characters gain a d=Demon subtype and the ability: "Pay 1: This character is replaced by one of the same cost from a random ranked legal faction. The new character gains a demon subtype and this exact ability in addition to their other ones". -At the beginning of each turn you may pay 2. If you do, if a character were to be created from an ability other than this one this turn, create another copy of it in the same zone. -Pay 6: Target character on the battlefield and all characters in play with the same name transform into 5/5 characters with the chosen character type. -Target creature you control gains +4/-4 each turn and one charge. -If this creature's Health becomes equal to or less than 0 as a result of this ability, it deals 4 damage to the opposing fortress for each charge it has. -Whenever a character an opponent controls dies, discard a random card. If you do, characters you control gain +2/+1. -Pay 2, Sacrifice a character: draw a card. Any player may activate this ability. -As long as there is a character on either side of Oyob, he is Unblockable and Untouchable. -If Aleta is in your graveyard for 6 consecutive turns, she is raised to the support zone at the end of the turn. -Pay 3, Exhaust: Target character in your graveyard is moved to your defense zone and gains the spirit subtype. At the end of the turn that character is removed from the game, whether it is alive or not. -Pay 1, sacrifice Aleta, Who Remembers All: Target character in your graveyard is moved to your Defense Zone and gains the Spirit subtype. This can only be used if Aleta is deployed. --Chosen player discards all cards in hand. that player draws a number of cards equal to the amount discarded. --Target character gets +10/+0 until end of turn. At the end of the turn, that character gets -0/-10 permanently. --Target character transforms into a 5/5 demon with "at the end of your turn, discard a random card." -All deployed exhausted characters you control are moved to your Defence Zone. -Whenever you sacrifice a creature, deal 2 damage to your opponent's fortress. -Whenever a non-artificial character controlled by your opponent takes combat damage The Blood Curse Ritual becomes 1% more complete for each point of damage. When The Blood Curse Ritual is complete, you win the game. -Feng-Kong cannot take combat damage from creatures with flying. -As long as this card is in play, all spirits you control gain +1/+1. -Pay 7, exhaust: remove all characters in your graveyard from the game, create X 2/2 spirit characters with flying, where X is the number of characters removed from play by this effect. -Sacrifice Monument Valley: at the end of the turn, create X 3/3 spirit characters with flying, where X is the number of characters removed from play this turn. I felt like it is time to update this. I hope you don't mind that I just did it, CommunistMountain. I tried to keep the style the same as it was before. If I mention the person that provided the challenge, then for one reason or another the winner of the last challenge wouldn't provide a new one. -At the end of each turn, recruit the insectoid character closest to the top of your deck. -Pay 10, Exhaust: shuffle up to 3 target insectoids in your graveyard into your deck. -Only your opponent can use this ability and only once per turn. Your opponent loses 5 life and 5 morale for each signature counter on Demonic Contract. -As long as Ashen is deployed, the cost of all ability cards is reduced by 1. -Ashen gets +2/+2 for every Ability card in every graveyard. -Pay 1, Exhaust: Choose a Character you control to follow this turn. -If Carrion Scavenger is following a Character it moves to the same zone and will not attack or block, at the end of the turn if that Character is in the Graveyard or has sent another Character to the Graveyard through combat Carrion Scavenger gains +2/+2. -Exhaust, and exhaust another Character you control: The Second Wave gets +2/+2. -At the end of each turn, if The Second Wave is not exhausted, you lose a maximum resource. Flavor: 1: The opening of the portals drew everyone's attention to the sleepers when they first arrived. 2: But when the sleepers returned, there was nobody watching. -While in Pure State, attack cannot be greater than 0. -This character does not take damage. Instead it adds the damage it would have taken to its health. When this happens, move this character to the assault zone and switch it to Mixed State. -While in Mixed State, this character's attack is equal to its current health. If it damages a character or the fortress, it switches to Pure State. Flavor: "No one can tell if it was created by science or magic and controling it is problematic at best." -Gains -0/-4 at the end of every turn. -Has +4/+0 and unstoppable if it has 12 health or less. -Has flying if it has 8 health or less. -Has untouchable if it has 5 health or less. Flavor: "Life in the demon wastes is usually dominated by change and very short. For some even shorter than for others." -At the end of your turn create a flying demon with attack and health equal to how much health your fortress lost this turn. -Pay 8 health: Deal 8 damage to a character on the battlefield. -When Herald of Madness is deployed all cards in your hand that do not have Exile gain Exile, where the Exile cost is equal to the cost of the card. -At the start of each turn, exhaust Displacement Drudge and another deployed artificial character. -If you do, remove target character from the game. At the end of the turn, that character returns to play. -If not, Displacement Drudge deals 4 damage to each character in the opponent's support zone and then leaves play. Would've done some more but was struggling to find good images for the card arts. They look really good. Could come right out of the game! It is really nice to see how some of the winning ideas could look like if they ever would be realized. Wow, in fact, really cool Nato! -While deployed, Tormented Monk must be in the Support Zone, at the end of each turn all players lose as much morale as the number of characters in their respective graveyards. Flavor: "And from the wall rose a dirge and all who heard were dismayed." -Sacrifice a deployed non-artificial character, overcharge, exhaust: Garlocc gains X satiation counters, where X is the sacrificed character's health. -At the end of the turn opponent's fortress is dealt damage equal to Garlocc's number of satiation counters. The number of Garlocc's satiation counters becomes halved. Flavor: "On the surface Garlocc is just a gaping maw but underground his body spans for miles." -CARDNAME becomes 10% more complete for each unused resource. At the start of the turn, if CARDNAME is 100% complete, sacrifice it. -This turn, you gain an additional 5 resources. Draw two cards. Flavor: These scraps have been requisitioned by the EURTF pursuant to Form 167, Subsection VII, Line 17. Filing paperwork in panic is advised. -The first time a card is removed from the game each turn, crate a 4/6 Artificial "Terracotta Warrior" in your support zone. -Overcharge 1, Pay 2, Exhaust; Create a 4/6 "Terracotta Warrior" in your support zone. "You would rebel? With what army?" - Sol. "THIS army." - Lucca and Xi. -Pay 6, Exhaust: Target deployed Character becomes Chained (It moves to your Assault Zone and becomes a Demon in addition to its other types). -Chained Characters cannot be moved from the Assault Zone. -If Vasir's Chains is destroyed, all Chained Characters are destroyed. Flavor: Though he'd finally managed to break them, Vasir knew the power that remained in the chains Aleta had forged to bind him. He would not let such power go to waste. -Whenever a Character you control would attack an enemy Character and the opponent has multiple defenders, it attacks the defender with the least remaining health. -At the end of each turn, each non-artificial Character you control that took combat damage this turn gains +2/+2 and becomes Artificial in addition to their other sub-types. Flavor: The potential of Genesis technology was of great interest to Kung Ji, particularly systems which involved the flow of information, such as live feeds of the battlefield and the ability to directly communicate with all of his troops or even a single specific soldier instantly. -Whenever a character on the battlefield dies, The Visage of the Nameless gains a counter. -When The Visage of the Nameless has 30 or more counters, transform it into The Nameless. Looks like an old statue. But who built it? Damn thing looks creepy. - Genesis Field Researcher. -The Nameless cannot be killed by non-damage sources. -When The Nameless enters play, both players gain 25 morale and 25 life, both players shuffle their graveyards into their decks, and both players draw two cards. -If The Nameless dies, you lose the game. -Djinn of Eternal Thirst can only be in the support zone if deployed. -Characters in your assault zone gain indestructible until end of turn. Remove this line of text from this card. -Draw a card, if that card is a character deploy it in your assault zone, at the end of the turn sacrifice that character. Remove this line of text from this card. -You lose 88 morale. Remove this line of text from this card. -You lose the game at the end of the turn. -When you deploy Evesta, select a card in your opponent's hand. Do not reveal this choice to your opponent. -If your opponent plays the chosen card while Evesta is deployed, instead remove that card from the game and create a copy of it in your hand. -When Evesta dies, remove her from the game instead of placing her in your graveyard. Flavor: "Repent, and I shall absolve you of your sins." -Whenever an opponent overcharges a card, CARDNAME gets a counter and then your opponent loses 5 morale for each counter on CARDNAME. They were cast aside, their souls scattered into the aether, but in time they gathered here, and their wrath shall be remembered, if not their names. -All non-unique humans you control on the battlefield gain +x/+y where 'x' is the number of humans you control in the assault zone and 'y' is the number of humans you control in the defense zone. When men stand beside one another in brotherhood, their will is indomitable. -If Dragon Cultist is a commander, characters in your deck may only be Dragon Cultists and characters with the dragon sub-type, regardless of purity. -Sacrifice Dragon Cultist: Dragons cost 2 less to play this turn. Use only while deployed. Flavor: "When the dragons poured through the rifts, some humans gave up their faction allegiances and began to worship the dragons themselves." -Choosing Dishonorable Anceistor as a commander reduces your max. morale by 6 for the duration of the game (per copy chosen as commander). -When Dishonorable Anceistor enters the deployed area, you lose 6 morale. -If Dishonorable Anceistor is removed from the game, you gain 6 morale. -Overcharge Fire Dragoon with a Flame Dawn Card. It gains charge and Flame Strike 3. -Overcharge Fire Dragoon with a Descendants of the Dragon card. It gains vigilance and the text "This card takes 2 less damage from all sources"
-If you do not overcharge Fire Dragoon, it gains +2/+2 when you deploy it. Flavor: To simply become a dragoon is considered a great honor. To die to one is an even greater one. -If Superior Tactician is in the assault zone your first attacker targets the defender with the lowest power, if it is in the defense zone your defender with the highest health blocks the first enemy attacker. -Exhaust, Pay X: Move X characters you control on the battlefield between the assault and defense zones, give them +1/+0 and swap their power and health. Flavor: "A squadron lead by this tactician is capable of adapting quickly to the battlefield, defenders can become vicious raiders and attackers stalwart guardians." -Flame Spitter Golem cannot become inmolated. -If Flame Spitter Golem is deployed, it is in the defense zone. -When Flame Spitter Golem is damaged, it deals X damage to your opponent's fortress, where X is Flame Spitter Golem's current power. -If the damage source is a character, it doesn't receive combat damage. Instead it becomes imolated receiving X damage at the end of each turn. Flavor: Those who faced him died without him even lifting one finger. Note: To bring the format of the Hall of Fame more in line with the actual submission form, from here onwards the winners will be presented in the suggested submission form of the challenge. -When this character is killed, your opponent loses morale equal to Marut's power and your health is recovered by that amount. -Pay 1, exhaust: Play the last ability you overcharged Elya with as if it was in your hand (meaning you also have to pay the cost of this ability). Elya gains -5/-5. Flavor: The mightiest witch of the Verore can cast any spell known to the cult, however her lifespan shortens with every application of her powers. Thus is the price of power. -If you deploy Rita's monstrosity, your opponent gains control of all your characters (command zone, deployed and graveyard). -The morale cost of Rita's monstrosity is equal to the sum of the morale cost of all characters your opponent gained control of this way. Flavor: Rita was abandoned by her people when she summoned this unholy abomination. -Whenever a character you control dies, it gains +3/+1 permanently. -When Yana, Life Merchant kills a character, return the character closest to the bottom of your graveyard to play. -Pay 3: Yana, Life Merchant kills target character you control. This can only be used if Yana, Life Merchant is deployed. -When you deploy the Archivist, you may overcharge him with an ability card. If you do, raise up to two non-unique characters from your graveyard. Their combined cost must be 4 or lower. -If the Archivist is removed from the game while in the graveyard, search your deck for an ability card with cost 4 or lower. Take this card to your hand. Flavor: He remembers everyone and everything that has ever been. Except for his own life before undeath. -Target two deployed characters your opponent controls. Both of them take 2 damage. -If they are in the same zone, all characters positioned inbetween them also take 2 damage. -If you draw this card by other means than the regular card draw at the start of your turn, all damage dealt by all Lightning Arch cards in your hand, deck or graveyard is permanently increased by 3. -If this card is removed from the game, reset the bonus damage on all Lightning Arch cards and shuffle it back into your deck instead. -When you play Memory Seizing Tome remove all Missions owned by the opponent from the game and any enemy Characters that started the turn deployed cannot be moved this turn. -At the start of each turn you may Overcharge a card, if you do not Memory Seizing Tome is destroyed. -When Memory Seizing Tome is destroyed return the removed Missions to the game at the same level of completion as when removed and move any enemy Characters that were in play on the turn this was played to where they should have moved that turn. -When you deploy Danse Macabre, it has 2 Counters. At the end of each turn, it loses 1 Counter. -At the start of your turn, if Danse Macabre has no counters left, sacrifice it and resurrect X characters from any graveyard that died while Danse Macabre was deployed. -These characters become undead in addition to their own character type. -X is the total number of counters Danse Macabre lost while being deployed. -Pay 2+Y, with Y being the number this ability has already been activated: Danse Macabre gains an additional counter. Any player may activate this ability, but only once per turn. Flavor: "In the cursed ruins of Veroria, damned souls gather for an eerie dance each night. Some dance to remember, some dance to forget." -Whenever you use the trading post, temporarily gain 1 resource your next turn. Flavor: Hmm... I'm sure we can free up some capital for your enterprise. -Characters you control with Exiles purity gain Flying and 0/+2 for each DoD purity in your deck. -Characters you control with DoD purity gain "This character takes 2 less damage from all sources" and Consume X where X is the amount of Exiles purity in your deck. -If Theodorus is chosen as commander, he counts as one of his purities of your choice, but only one at a time. -Whenever your opponent plays a card with 2 or more purity, remove all other cards with the same name from the opponents hand, deck and graveyard. -Cards with 2 or more purity get removed from game upon entering the graveyard. -Whenever a card you control with 1 or less purity enters the graveyard, shuffle it back into your deck instead. Flavor: Some things have to be remembered. Others are better left forgotten. -When you deploy Distribution Attacker, you can target a deployed character you control. -Move half the power of the target character(rounded down) over to Distribution Attacker. -As long as CARDNAME is deployed, Locations you control have "Your characters take 2 less damage while in the Defense Zone." -At the end of the turn, if CARDNAME is in your defense zone your fortress heals for 5 health. Flavor: Add some earthworks here, a bastion there, a good ditch in the front... it's not much, but I can work with it. -Whenever Perpetuum Mobile ends its turn on the battlefield, it is moved to the support zone and permanently exhausted. Flavor: "Come on, we are almost there! Just give us a bit more time - and funding - and it'll work, I can feel it in my bones!" - Unknown GI-citizen employee, before defunding of the project (and demotion of the project leader). -When Volcanic Manifestation is deployed, all other characters take 3 damage. -Volcanic Manifestation can be played from the graveyard as long as you control deployed characters. -Whenever a character is raised from a graveyard, it becomes artificial and undead in addition to its other types and gains +2/+2 permanently. -At the beginning of the turn after CARDNAME dies, select target character in a graveyard that costs less than CARDNAME and raise it to your support zone. It becomes artificial and undead in addition to its other types and gains +2/+2 permanently. This effect only works if CARDNAME is still in your graveyard at the start of the turn. -Exhaust, pay 3 resources, and target a unit you control; This turn, if it hits the fortress, draw the top character of your opponent's deck and put it into play in your support zone during your end phase. Flavor Text: Not all beings suffer the infection equally. Sometimes, the virus lies in wait for hours, days, before exploding into virulence, infecting those nearby as well who never suspected a thing. -At the start of each turn if this is deployed you gain 1 extra resource for the turn if you have initiative, you lose 1 resource for the turn if you do not have initiative. -When Spellbreaker enters the Deployed Area, it gains +1/+1 for each Ability card in opponent's hand. -When Spellbreaker hits the fortress, he changes two Ability cards in your opponent's deck into Placebotron card. -Opponents skip next planning phase. - Each player sacrifices a random Character he controls and revives the top Character from his Graveyard to his Support Zone, revived Character becomes a Demon. - If a player does not have any Characters in play, he loses 10 morale as a cost of resurrection. - Card does not affect player with both no Characters in play and empty Greaveyard. -At the end of the turn if there are 9 or more Undead Characters in your Support Zone which were in the Support Zone at the start of the turn, Virus Dispersal becomes complete. -When Virus Dispersal is completed it sacrifices all Undead Characters in your Support Zone, applies Poison 2 to all non-Undead Characters, and all non-Undead Characters on the Battlefield become Undead and are raised to your Support Zone when they die. -After 2 turns that character becomes untouchable and you must select a new one. -If you can’t select a new character or any of the selected characters die or are removed from the game, then Lucky star is removed from the game and all your characters lose untouchable.